Dr. Jekyll and Mr. Hyde is a action-packed strategy "dodge 'em up". Agent Jekyll, undercover agent, passing as the innocous Dr. Jekyll, has the mission to secure the church before the famous terrorist gang, the 'Pink Lincolns', take over the place. Armed with nothing, and passing up as just another innocous civilian, Jekyll has to get through a city riddled with crime. Street bombings are commonplace; as are the trained combat dogs and their owners, the agressive combat cats and the precise headhunters. - stutter stepping: same thing as above, but stop for 4 frames (= 1 'ingame' frame). When Jekyll scrolls the screen enough so that he is barely able to fit between a 'step' and the corner of the screen, lands on that spot facing left, turns right, then jumps, he will clip out the screen and reappear at the very right of the screen. The most obivious advantage is being able to bypass dog-jumping, since you scroll past them, being at the right of the screen. However, this trick is not used in the run anywhere because of its tremendous setup time (300 frames) and its utility is limited where luck manipulation can do better work in a shorter time. Massively abused in the last screen. If you do the stair glitch, then jump into another stair, you will end under the ground. 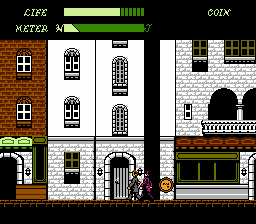 Walking for a bit, then jumping again puts you at the very right of the screen in somewhat incosistent conditions, at the very right position for Jekyll to dodge every obstacle in the game. The health routing is perfect in the run. The previous TAS chose to take no damage on purpose: I take as much as possible on purpose for damage boosting. Dying at the exact frame you trigger a cutscene (end of a level) while jumping will trigger the cutscene when landing. Useless, but cool. Used at the end of the game. This run can't be accurately compared with the published run (FCEU..). Lag frames are emulated really badly. Even then, 2143 frames were saved. I started this run to improve the currently very old published run and ultimately finished it out of hate for the game. TASing this is equivalent to kindly bashing your head over and over against a spiked wall. Thanks to arandomgameTASer, for finding a trick early on and doing some WIPs of Level 1. None of his input is left in the run. xy2_: I'll be cancelling this due to major improvements related to the stair glitch, and a new glitch leading off to it (perfect clipping). The run itself is changed as a whole and has a very different watching experience, which leads me to cancelling this movie and submitting a redone version in the near future.